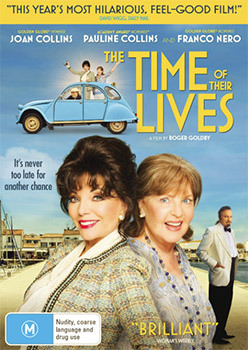 Thanks to Universal Sony here is your chance to win one of 10 x The Time of Their Lives on DVD. Written and directed by Academy Award™ nominated filmmaker Roger Goldby (Cutting It, Lilies), The Time of Their Lives is the hilarious story of an unforgettable road trip across Europe. Starring Golden Globe™ and People's Choice™ award winner Joan Collins (Dynasty, Tales from the Crypt), BAFTA winner Pauline Collins (Shirley Valentine, Quartet) and Golden Globe™ nominated Franco Nero (Django Unchained, Die Hard 2), The Time of Their Lives takes outrageous to a new level as a washed-up movie star is determined to gatecrash her ex-husband's funeral. The Time of their Lives shows that it's never too late to reconnect with life's pleasures. Living in a dreary London nursing home, Helen (Joan Collins) is a downcast, former Hollywood star whose days of debauchery have left her penniless, family-less and under care. After a chance encounter with Priscilla (Pauline Collins), a downtrodden middle-England housewife, they stage an exciting escape to attend the funeral of a successful director who happens to be Helen's ex-husband. Travelling across Europe by coach, ferry, car and foot to the ever-so-glamorous Ile de Ré, France, two strangers grow closer and meet a cast of colourful characters, most notably a millionaire living quietly in the French countryside named Alberto (Franco Nero). The romantic instigator of an unlikely love triangle, Alberto brings with him hilariously inappropriate moments that will leave you convinced that it is never too late in life to be impulsive and wild. Hilarious, uplifting and shocking at times, this is a classic movie that is sure to leave you giggling throughout. Behind the fun and games, however, are deeper insights into one's struggle with past life choices, controlling husbands, and mortality. Leave boring behind and join show business icons Joan Collins and Pauline Collins on this unforgettable journey of spontaneity, friendship and have the time of your life when it is released on DVD from November 15. *Helen (Joan Collins) asks "So is your wife dead or has she gone..............?"